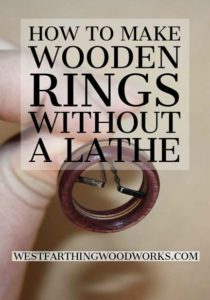 This is How to make wooden rings without a lathe. 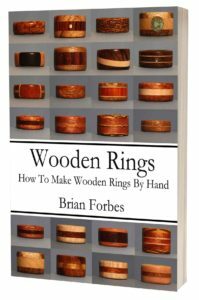 Wooden rings are a lot easier to make than you might think, and you don’t need a lathe to start making your own. In fact, you don’t need many tools at all. Let me show you how to do it. Most of you that want to make a wooden ring do not have many tools. That is very common situation in the beginning for most woodworkers. To solve the problem, all you have to do is pick out projects that you can make with the tools you actually have. Wooden rings for example can be made in a number of different ways. The lathe being one of the most popular, but hand tools will still do the job very well. If you already have a couple of basic tools, you may only end up needing an inexpensive electric drill, some files, sandpaper, and one or two drill bits. When you look at how little it actually takes to make a wooden ring, anyone who’s interested should really give it a try. Read these 13 tips on making your rings without a lathe, and you will see that it’s easier than it looks. Enjoy. In the beginning, you only need a cheap drill to make rings. Sure, a drill press is nicer, but you don’t need it. Find an inexpensive electric drill from a home store or a tool store, and you will be able to do several things. First, you can drill your finger openings. That’s the most obvious. What’s not as obvious is that you can add buffing wheels to your drill. You can also use ring turning mandrel that chucks into a regular drill. These attachments allow you to finish your rings like the pros, but on a budget. They also let you turn your rings almost like having a lathe. It’s a much longer process, but you get to use power instead of elbow grease. Next, buy some Forster Bits or Paddle Bits. These are special drills that are meant for making larger holes in wood. They are found everywhere too. The paddle bits will be in a lot of places, and the Forster’s a few less. However, online you can get them all. Focus on sizes that range from 5/8” to 1.” These are the most common sizes for the finger opening. Any of the fractional sizes can be achieved through sanding to widen the opening. If you can buy singles, you might save a little money. However, look at the set prices in case they are a better deal. Typically after you buy a few bits, you might as well get the set. If that’s the case then just get the set. The drills are super useful. After you make your finger opening, you need to rough out the blank. This is done the easiest with a small hand saw. You can find one of these in any hardware store, and even in some grocery stores in the hardware section. A simple saw is perfect. All you need it for is to remove the larger pieces of material from your ring blank. After that, you will move on to files or sandpaper. The blade needs to be small enough to cut the blanks, without a very aggressive tooth set. The problem with a very wide set of saw teeth is that they can tear out wood. You don’t want that to happen on a small ring making blank. Instead, look for a finer blade set. You will saw a little slower, but you will get better results. One of the best saws for rings is a dovetail saw. Another is a hack saw for metal. It will go through wood just fine, and these are carried everywhere. Cheap too. Here is a YouTube video that I created where I will show you how to rough out the blank with a hand saw. It’s easy to follow, and it explains the process really well. If you can splurge a little, a power sander is awesome. These small palm sanders are great for making rings. Any time you can add power to the process, you always make things go faster than doing it all by hand. The other nice thing about a power sander is that you can clamp it down and use both hands to work the ring against the pad. When you do this, you free up both hands. You get more control, and the work becomes easier. Letting the sander do the work, you will also be able to make better rings, without as much energy. This means an easier time in the shop. It also means better designs, because your energy can be used for creativity rather than making yourself sweat. After removing the bulk of the waste wood from the blank, you need to start shaping. This is easiest with small wood files. You can even use some bigger files, as long as you can move them around the ring. Clamp the ring in a vise, or clamp it to your table. Then, start filing the exposed area. Work the area until the shape starts to come in. After you get close, rotate the ring and make the next area match. Keep doing this until you are very close to your final size. Filing your wooden rings is not a long process when compared to sanding. Take your time, and don’t give up if you get tired. Instead of powering through and becoming frustrated, take a break. Come back rested and you will work much better. The big key to working with your files and sandpaper is to get as close as you can before switching to something finer. For example, you should use the file to get yourself as close to finished size as possible before going to sandpaper. The advantage is the cutting action. When you cut with a file, the wood comes off easily. In contrast, sandpaper is more time consuming. If you are still removing wood, it makes sense to stick with the files as long as possible. This way, you make the job as easy as possible. When you do switch, you will find that your time on the next finest smoothing material will be significantly less. You can apply the same logic to the grits of sandpaper. Don’t switch until you have done everything you can with the grit you are using. Once you do, then it’s time to switch. On the topic of sandpaper, you will need it. Making the ring off the lathe means a lot of sanding. You would still sand a lot on the lathe, but the machine does the work. Instead, you will be doing the work, but it’s ok. If you work on sanding the right way, you will have a cut easier time. The wooden ring is so small too. This means a much easier time. It will not take long to sand the surface to a smoothness that you are very happy with. For a good start, get a few grits. For roughing, use 80-100 grit. Then a good middle grit is 150-180. After that, 220 grit will do the majority of the smoothing. If you want to go another step, add 320-400 grit to the mix, and you will have a very smooth surface in the end. Once you have your ring sanded, you need to finish it. The oil finishes are the easiest to use, and the easiest to learn. If you have never finished anything before, then oils are really where you need to be. Pick up a nice Walnut Oil or even a small bottle of Tru-Oil. Apply the oil according to the directions on the container, which typically means rub it on. After the oil absorbs a little and cures, you will have a nice, warm looking tone to your wood. If you are familiar with finishes, and you want something that you can spray, you can always use furniture grade lacquer. This is much better than the $2 a can stuff at the hardware store, and worth the extra cost. Simply spray the ring lightly from a few angles to coat the surface. Allot it to cure, and you are done. 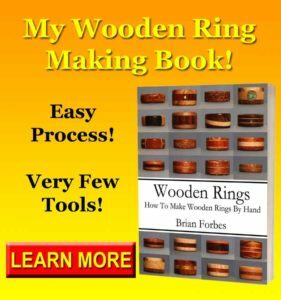 Make Wooden Rings Without Many Tools! Available Now on Amazon! If you are on the fence about making wooden rings because you don’t have a lathe, then get right off. You may already have the majority of the tools you need right int your shop. If you do, you can stop dreaming about making rings. All you really need is a way to make the hole, a small saw, and some files and sandpaper. After that, apply an inexpensive oil finish, and you are all done. The process couldn’t be easier, and more fun at the same time. Don’t just walk away after reading this and do nothing. Action is where you make changes, and rings. If you have any questions on How to Make a Ring Without a Lathe, please leave a comment and I will be glad to answer them. Happy building.